Meet the Bengals behind the Blog! Hello! My name is Dukey Danger. Yes, Danger is my middle name, and I am a two year old Bengal Boy. I live with three humans; a mom, her daughter and son as well as a Bengal named Cheddar. I love riding in the car, playing video games and zooming around the house. I will do anything for a Temptations cat treat or a bite of blueberry muffin. My father was a red marble Bengal named Flame On! I have inherited his rufous or red toned pelt. I am so excited when visitors come to the house. I greet everyone from the plumber to the kid’s teen friends with enthusiasm. My dream in life is to go to the dog park and make some new friends. I get bored with toys easily and since I’m 15 pounds I tend to break them. Mom has to keep me in constant supply. I hope you visit my Top 10 favorite toys page. Hello! My name is Cheddar Escape. Yes, Escape is my middle name, and I don’t want to talk about it, I just want to do it. 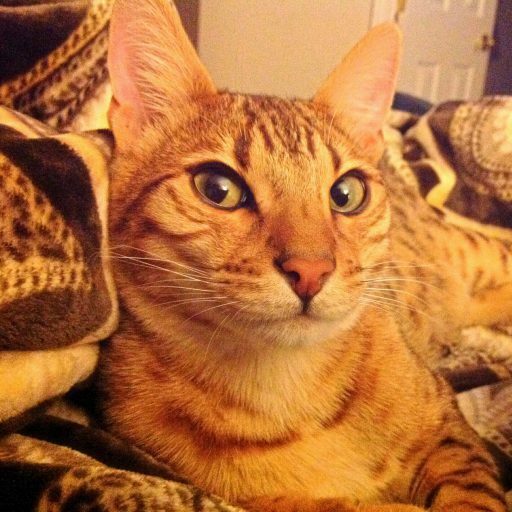 I am an almost three year old Bengal Girl. I am a retired breeder. I had only one litter of kittens. They died during childbirth and I almost did too. After emergency surgery saved my life I was too sad to continue living with the breeder. My humans adopted me and now I live the very happy life of a family cat. It took a while for me to feel safe and I have a some advice to give on adopting a retired breeder and bringing a new cat home and how to introduce a new cat to an existing cat. I am “toy driven” as the experts call it and I love to play and be petted. My mom was a snow Bengal and I am light with a whited tummy. Weighing in at only 8 pounds I am on the small side of the Bengal weight scale and look like a kitten. I make up for it by being the biggest. loudest purrer in the family. My dream in life is to own one of every cat toy in the world. I love it when the mailman delivers the amazon.com box as purrrsonally, I always think it is for me. I hope you visit my page on bringing a new kitten or cat home.